How do I transfer a WSSC account into/out of my name? When and where are WSSC’s public hearings held? What is WSSC doing to safeguard the water supply? How do I get the meter tested? How to locate a WSSC Certified Plumber? How does WSSC bill water and sewer charges? Can I provide a meter reading without speaking to an agent? My billed charges are high: can WSSC help? Will WSSC adjust the high charges? What if I still have billing issues? What if I have issues with a bill I've already paid? Is discolored water safe to drink? Can I turn off the water at my house? How? What are the round metal covers I see in the streets? Whom do I contact about a broken, loose or missing cover? I have low pressure or high pressure in my home. What should I do? What are Cleaning and Lining? Why is it being done in my neighborhood? I see water surfacing in the street or shoulder of the road. Who should I call? What is a water lateral (service) and for what portion am I responsible? My basement is backed up with sewage. Whom should I call and what should I do? Who should I call about the sewer odor? Who should I call to obtain additional information about sewer leaks? What can I do to help prevent sanitary sewer backups? What are manholes? Where are they located? What is a cleanout? Where is it located? Who is responsible for potholes? Are storm drains connected to the sanitary sewer? Who is responsible for the storm drains? Please refer to the Settlement or Moving Form page. Customer Service agents handle routine metering and billing inquiries weekdays, between 7:30 a.m. and 7:00 p.m. at 301-206-4001, 1-800-828-6439, or cust-services@wsscwater.com. Emergency Maintenance agents can be reached 24 hours a day, 7 days a week, at 301-206-4002 or emergencycallcenter@wsscwater.com. During our budget-approval process, Montgomery and Prince George’s County councils approve the rates. Public hearings on our proposed budgets are held each year prior to February 15, and any changes take effect on July 1. If you want more information about the hearing process or the public hearing schedule and locations, please contact the Communications and Community Relations Office at 301-206–8100. Our nation’s biggest tragedy has resulted in an increased safety awareness of the various infrastructures upon which we rely every day. Our mission has always been to supply safe, clean water to our customers. In doing so, we take security very seriously. We have a strong foundation of ongoing safety measures at WSSC: security at our facilities; round-the-clock monitoring of our distribution system; state-of-the-art security technology for our computer and operations systems; and extensive water quality testing of our water from source to tap. Please be assured we are taking all appropriate steps to safeguard your water. Since 911, security has increased at all our facilities and our officers are on the highest alert, 24-hours-a-day, seven days a week. We also are closely coordinating with local and federal authorities. How much water does a household use on average? Please refer to the Household Water Usage Chart. Prior to calling WSSC, please check the property’s main shut off valve to ensure it has not been accidentally turned off. If your main shut off valve is fully open and you do not have a past due balance, please contact an agent at 301-206-4001 or 1-800-828-6439, 7:30 a.m. and 7:00 p.m. or cust-services@wsscwater.com. A telephone call, in most cases, will be handled quicker than an email request. WSSC must receive a completed Release of Liability (ROL) prior to restoring service. If your account is past due, you will need to pay the delinquent balance and any fees in full prior to WSSC restoring your service. Emergency Maintenance agents can be reached 24 hours a day, 7 days a week, at 301-206-4002 or emergencycallcenter@wsscwater.com to address non-delinquent issues. Please refer to the Meter Testing page. Residential and some commercial customers using less than 5,000 gallons a day can expect to receive a bill from WSSC approximately every three months. Our commercial customers with an Average Daily Consumption (ADC) of 5,000 gallons or more per day receive a bill approximately every 30 days. Depending on the date you moved into the property as well as our meter reading schedule, your first bill may contain charges for only a portion of the initial three-month period you occupied the premises. Then bills will be mailed quarterly. Pipeline is an informational publication included with each bill that provides public hearing dates, conservation techniques, policies for adjusting accounts, and other topics of interest. WSSC now offers Electronic Paperless Billing, learn more about Go Green. Your billed charges are based on the amount of water that passed through the meter since the last billing period. Sewer; however, is not metered and charges are based solely on water consumption. Your overall consumption is then divided by the number of days in the billing period to come up with the “average daily consumption.” The higher the ADC, the higher the cost per thousand gallons. Our incremental rate structure is designed to encourage and reward water conservation. “Comparable” consumption is what was consumed during the same time period in the previous year. If there has been a dramatic increase based on your comparable consumption, we will alert you in the important message section of the bill. WSSC charges more for sewer service because wastewater treatment is more expensive and complicated than water filtration. Each bill also includes an item labeled Account Maintenance Fee. When circumstances such as inclement weather, an inaccessible or obstructed meter, or a locked gate (to name a few) prevent WSSC from obtaining an actual meter reading, our computerized billing system automatically generates an estimated bill. We will also estimate usage when there are questionable changes in current consumption compared to historical usage. A residential customer's usage is estimated based on the household’s comparable usage. When there is a new owner/occupant at the property, the estimated bill is based on a preset Average Daily Consumption (ADC) of 245. Commercial customers' bills are estimated based on the previous occupants' ADC. To provide an actual reading during non-business hours, please access our Interactive Voice Response System at 301-206-4001. You can provide an agent with your actual meter reading Monday through Friday at 301-206-4001 or wssccallcenter@wsscwater.com. The actual reading in almost all cases cancels the estimated charges and re-bills actual usage. We will credit your estimated bill payment when we reduce the current charges by the amount of the estimated bill payment. Please refer to our Payment Options page. If water is used outside (i.e., landscaping, filling pools, car washes, power washes), be prepared for a higher Average Daily Consumption (ADC) resulting in higher billed water and sewer rates. Installing a sub-meter or leasing a fire hydrant could be what you need. Without a properly installed sub-meter or a fire hydrant rental, your billed charges will be based on your water consumption and the outside water usage never returns to the public sewer for treatment. Please refer to our Sub-Meter Information file. Please refer to our Fire Hydrant Meter Information page. If you have a high bill and you do not know where the water is going, you may wish to check the property for leaks, especially toilet leaks. In fact, one leaking toilet can lose as many as three to five gallons each minute, often silently! The three most common toilet leaks are: flapper, siphon tube, and overflow leaks. In many cases, a new toilet tank kit or new flapper from the hardware store will remedy a toilet leak. Toilet flappers and toilet tanks should be checked at least once a year. Please refer to our Household Leak Detection page. The most commonly offered adjustment is our courtesy “High Bill Adjustment” (Single Unit Residential Properties). This adjustment applies if a “single unit” residential customer receives a bill with an average daily consumption (ADC) at least three times the comparable ADC and no other applicable adjustment policy exist. Eligible customers may receive this adjustment on one bill once every three years while at that property. Charges are adjusted based on comparable or current ADC plus 50% of the excess usage on the one bill. Comparable consumption is your billed ADC from the same time period in the previous year as long there were no occupancy changes after the comparable period. A single unit commercial property can also receive a High Bill Adjustment (Single Unit Commercial Properties); however, the higher than normal charges are re-billed based on comparable or current (if no comparable consumption is available), plus 75% of the excess usage. Unlike the residential high bill adjustment, a commercial property is limited to one high bill adjustment. In this example, the January 12, 2012, consumption does not qualify for the HBA. The “comparable” January 1, 2011, charges were based on a 121 ADC. The 319 ADC billed January 12, 2012, is not three times the comparable (121 x 3 = 363). However, the 392 ADC billed April 1, 2012, qualifies (if occupancy did not change and there were no leaks) since it is at least three times the comparable 98 ADC billed March 31, 2011 (98 x 3 = 294). Call 301-206–4001, 1-800-634-8400 or cust-services@wsscwater.com. We will thoroughly review the account to determine whether the charges qualify for adjustment according to WSSC’s policies and guidelines. If you are unhappy with our decision, you may appeal the billed charges in one of two forums. Please refer to the Dispute Resolving Board page. Please refer to the Refund Hearings page. Yes, we will assess a fee if a check is not honored, your bank does not satisfy an electronic debit, or a credit card payment is not properly authorized. Furthermore, a "cash only" status will be assigned to the account for six months. During that period, payments must be made via certified or bank check, credit or debit card, Western Union Quick Collect, or money order. Written notification that a payment has not been satisfied and that the account has been placed in "cash only" status will be mailed to the service address. Please visit our page on discolored water and flushing guidance. You may contact a private laboratory for an individual analysis of your water. Laboratories are listed in the yellow pages. WSSC does not recommend specific laboratories and we do not do individual water analyses except to isolate or identify a system problem. We routinely test the water at specific sites within the distribution system. We do provide tap water analyses for the Potomac and Patuxent Filtration Plants and are happy to send you a copy upon request. You may also view it online. 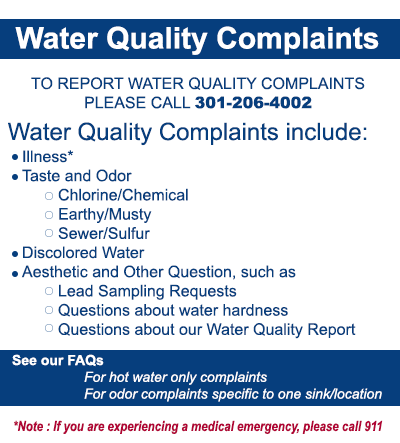 If you have a water quality issue, please contact our Laboratory Services Group at 301-206-7575. The “main valve” turns the water inside a property off. If you have an inside meter, check the valve near the meter. If you have an outside meter, the main valve is usually located near the hot water heater or where the service enters the property. To operate the main valve, turn clockwise to the right (until it stops) to close, and counterclockwise to the left (until it stops) to open. If you need the water turned off from the outside, contact a plumber or WSSC. WSSC charges a disconnection fee to turn the water off and a fee to turn the water on. A registered plumber can also make the disconnection and reconnection request for you. Covers can be located in the street, shoulders of the road and in a customers’ yard. These covers are over water, sewer, storm drain, telephone, and gas structures. Most covers have some type of identification. At the property line covering meters and curb boxes (the water turn on/off valve) and sewer clean outs. If you have identified the cover as water or sewer, please contact WSSC's Emergency Call Center at 301-206-4002 or send an email to emergencycallcenter@wsscwater.com. Please provide the cover’s exact location and, if possible, the approximate size of the cover/opening. Please contact WSSC's emergency line at 301-206-4002. We will investigate to determine the location of the leak (on or off property). The homeowner is responsible for the water service (lateral) from the house to the property line and all the pipes within the house. If the leak repair is the owner's responsibility, WSSC will confirm this in writing. If the leak is in the WSSC portion of the service or on the main, we will notify the occupant/caller. We will make repairs and restore the affected area to its original condition. Pressure is the force of water within the system. Other terms used in conjunction with pressure are static (not changing - pressure at the hydrant before flow) and residual (pressure left in a pipe system when high water flow rates are occurring). Water pressure is measured in pounds per square inch (PSI). Low Pressure/Flow is generally described as not enough water in the system. If the problem is low flow, you should check with a plumber. The problem may be a restriction within the pipes or a problem with just one plumbing fixture. If the "low flow" problem is found throughout the property, please call WSSC and we will check the pressure at the closest fire hydrant and your property. An adult 18 or older must be available for us to access the property. Understandably, our crews will have to address system-wide emergencies and other critical events prior to investigating low-pressure concerns. Pipes that are restricted and do not allow a proper flow of water. The system pressure can be satisfactory regardless of the restricted flow. A partially closed main valve or individual fixture valve. A malfunctioning Pressure Reducing Valve (PRV). Screens on individual fixtures (filters or aerators) may be clogged. The screens can be easily removed, rinsed and replaced. High Pressure is stronger than normal water flow from the spigots. If pressure is too high, you can experience banging pipes, a tripped hot water relief valve or washers that quickly wear out. A malfunctioning PRV can cause both high and low-pressure problems and maintenance is the homeowner's responsibility. You may wish to contact a plumber for an inspection. Cleaning and Lining is a process of applying cement-mortar lining to the water main’s wall. This process rehabilitates mains that have scale, corrosion and iron and manganese build up. The build up can cause discolored water and pressure/flow problems. Discolored water complaints and issues. Street resurfacing projects - if the main is more than 30 years old. Installing bypass lines (above ground) to provide temporary water service to customers during the rehabilitation process. Removing the buildup of iron and manganese from the pipe by steel scraper blades drawn through the pipe. Clearing the line of water and debris with a squeegee. Mixing and pumping cement-mortar through a hose to the interior wall of the pipe. Smoothing the surface of the finish running a trowel assembly after the equipment that sprayed the lining material. Cutting out or blowing out the service connections before the liner dries. Testing the water prior to placing the main back in service. Please contact WSSC's Emergency Call Center at 301-206-4002 and provide as much specific information as possible (e.g., water is streaming, gushing, the intersecting streets). An inspector will be dispatched to investigate your concerns. The contractor installing the water main generally installs the water service from the main to the property line. WSSC is responsible for maintaining the individual water service (lateral) from the main to the property line. Service lines (laterals) are generally ¾" to 1 ½" for private homes and up to 12" for larger commercial buildings. WSSC uses copper and ductile iron for the service. In the past, some galvanized pipe was used. Copper pipe; however, is replacing galvanized pipe. The lateral from the property line to the house and all water pipes within the house/building are the homeowner’s responsibility. On-property water service can be copper, galvanized or plastic. Call WSSC's Emergency Call Center at 301-206-4002. A Customer Service agent will review the property’s history and instruct you based on our records. Is the problem with an individual fixture such as the kitchen sink? If so, you may attempt to clear the blockage yourself or contact a plumber/sewer drain cleaner. Is the problem with a commode located above the lowest level (floor) of the building? If yes, you may attempt to clear the blockage yourself or contact a registered plumber/sewer drain cleaner. Is the problem with the lowest facility (toilet, shower, or laundry tub) in the house/building? If yes, contact WSSC to investigate. Is the service constantly backing up even when the occupants on the premises are not using the facilities? If yes, contact WSSC to investigate. When a service is backing up only when the occupants are using their facilities, or the problem is not in the lowest level plumbing fixtures, we suggest contacting a registered plumber or a sewer drain cleaner for assistance. If you are unsure, please contact WSSC for assistance. Generally, the contractor installing the sewer main installs the sewer service from the main to the property line. 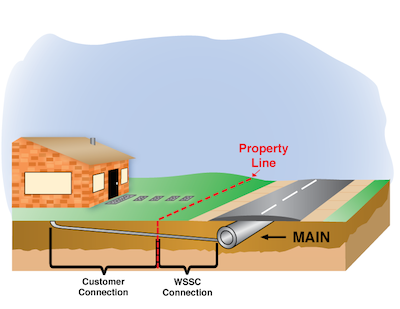 WSSC is responsible for maintaining the individual sewer service (lateral) from the main to the property line. Service lines (laterals) are generally 4" for private homes. The service line from the property line to the house and sewer pipes within the house is the homeowner’s responsibility. An obstruction in the main (in the street) or service line can cause sewer odor where gasses are trapped but a backup is not occurring. The gasses can escape through manholes or the drains in customers' homes or buildings. Unless the odor is isolated to one fixture or in an upper bathroom only, WSSC will investigate. Contact WSSC's Emergency Call Center at 301-206-4002. Also, add approximately 2 cups of water to your floor drain. If the floor drain is dry, the sewer gas from the main or service can get into the house and cause an odor problem. Contact WSSC's Emergency Call Center at 301-206-4002. See Service Alerts for open emergencies. There are several causes of clogged sewers. In our area, one of the main causes is tree roots that may enter at the joints of pipes or cracks in older pipe. (Roots seek water and they often force their way through the cracked pipe.) Also, broken pipe may allow soil to enter and cause a problem. Grease is also a main cause of clogged sewers. Introduced into the sewer lines, grease can harden or collect resulting in stoppages and backups. Be careful what you put down the drain. Several items that should not be put into your sewer system are paper towels, diapers, grease, paints/solvents, chemicals, antifreeze, non-food oils, and any non-dissolvable item. Please deposit grease and food scraps into a can or the trash for disposal. Our Can the Grease fact sheet contains more grease disposal information. WSSC and other utilities use manholes to access our underground infrastructure. Our crews also use manholes to clear stoppages. Manholes are located in the street or in a WSSC right-of-way area. A cleanout is an entry point into the sewer service that is used to clear obstructions in the line. A cleanout can be located inside or outside. An inside cleanout it is often referred to as a "stack plug." WSSC maintains cleanouts located in the public area (not on private property). However, the maintenance of an inside cleanout or on the owner's property is the owner's responsibility. Potholes are generally the responsibility of the county, municipality or jurisdiction where located. WSSC will restore any areas impacted during WSSC construction or WSSC maintenance work. Please call 301-206-4002 to notify us of your concerns. Storm drains are above ground open drainage ditches or below ground systems of pipes that collect and carry off rainwater. The storm drain system is not connected to the closed sanitary sewer pipe system. How do I check my toilets and plumbing for leaks?